Dive into the world of DIY jewelry with these beginner jewelry making tutorials! So, you are ready to become a jewelry maker? You are in luck! 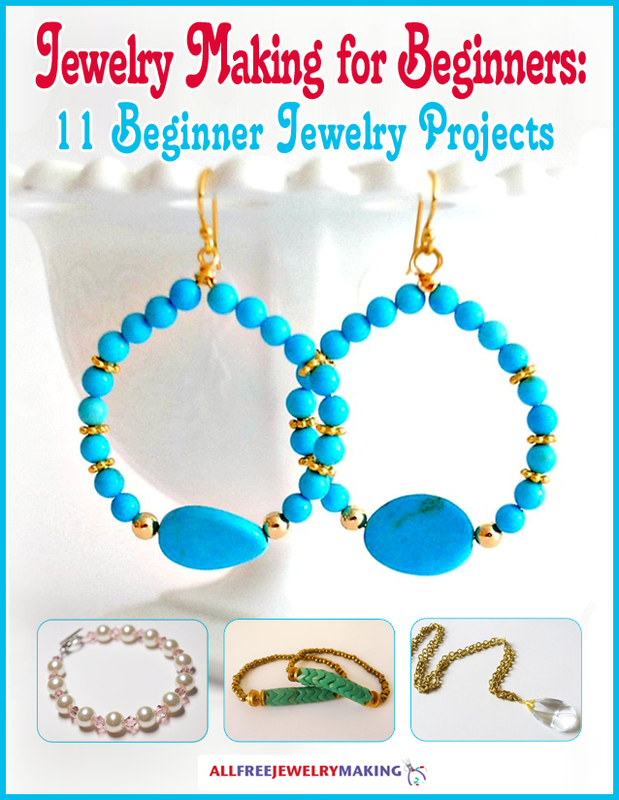 This collection, 240 Beginner DIY Jewelry Tutorials, is perfect for you. Designing your own jewelry is a ton of fun and opens up a whole new world of creative possibilities. You are sure to love the artistic freedom that comes from creating your own beginner homemade jewelry designs. First, though, you need to master the basics. That is where this jewelry making for beginners collection comes in. From macrame to stringing and wire work to stitching, you will discover the basic techniques of DIY jewelry making. Between all the tools, techniques, terminology, and materials, learning how to make jewelry can be a bit intimidating at first; but, with these tutorials meant for jewelry making for beginners, you can feel less intimidated. Each section covers a different technique and within that collection, there are projects to test out your newly acquired jewelry making skills. So don't be stressed, jewelry making is fun and exciting. Explore a plethora of accessory making opportunities with these DIY jewelry making tutorials. Plus, rather than staring blankly at the jewelry tool section of the craft store, make sure to check out our jewelry guide video below! Jewelry tools can be intimidating for any beginner, but thanks to this guide, you'll learn all the ropes. Macrame bracelet patterns are so easy and require so few supplies, everyone can get in on the fun! All you need is some cord, string, rope, ribbon--anything you can tie into knots to create fabulous accessories. The best thing about this collection of 34 Fabulous Macrame Bracelet Patterns is that no experience is required. You'll get the hang of the technique in no time at all; so, get started today making these macrame bracelet designs. Simple stringing patterns are some of the best DIY jewelry projects for beginners to start with. You can learn the ropes without getting all tangled up in tricky techniques by trying this collection of 36 Simple String Jewelry Patterns. Even though these patterns may be simple, they're no less impressive. Get started today making these beautiful homemade jewelry projects. If you're new to making wire jewelry or just want to brush up on some techniques, we have a great collection of 54 Simple Wire Jewelry Making Tutorials to choose from! This collection has a little bit of everything to easily get your feet wet in the world of wire jewelry making. From basic wire jewelry instruction for beginners to learn how to wire wrap to mastering crochet wire jewelry, there is something for everyone in this collection of wire jewelry tutorials. So you've mastered macrame, are stellar at stringing, and are a whiz at wire-wrapping, and now you want to be a beader? Jewelry making for beginners isn't just limited to using strings! This Beginner Beading Tutorials: How to Peyote Stitch, Brick Stitch, Square Stitch and More is the collection for you! We've rounded up beginner beading tutorials on some of the essential techniques that you will want to learn if you are truly interested in becoming a beader. In this collection, you'll find tutorials for peyote stitch patterns, how to brick stitch projects, square stitch techniques, right angle weave jewelry designs, ladder stitch tips, and more. When hot weather hits, the last thing you want to wear is heavy chains, wire, and beads that stick to your skin and weigh you down. That's why the summer season is all about hemp bracelet patterns! Keep it light and airy all summer long with these 29 Easy, Breezy Hemp Bracelet Patterns. Never used hemp before? No worries - these simple bracelet patterns are easy enough for any beginner to try! Kumihimo is a time-honored Japanese technique is taking the jewelry-making world by storm! Kumihimo is a braiding method that is done by knotting cords together to create a chunky, textured weave. This collection of 25+ Kumihimo Jewelry Patterns and Tutorials will teach you everything you need to know to start braiding your own beautiful kumihimo jewelry! From beginner-friendly kumihimo patterns to 12-strand and beaded kumihimo, this collection has all of the bracelets and necklaces you need to get started with kumihimo. Chain maille patterns aren't just for medieval soldiers! Off the battlefield, chain maille is a long-standing tradition in the jewelry world, and to pay homage to this time-honored jewelry-making technique, we've collected 46 Free Chain Maille Jewelry Patterns to inspire you to create your very own beautiful woven chain bracelets, necklaces, and earrings. Whether you're a novice or intermediate jewelry maker, these easy chainmaille patterns always start with one small jump ring. What tips would you give to a jewelry beginner? Wow this is such a nice collection of easy tutorials! I like how even if you're new to making jewelry, there are a lot of cute options to try. This is one of your best books ever. There are things in it that I have never tried even a fter years of working in jewelry making. But there are a lot of great projects for beginners. That's just what I need to use when I am teaching someone how to make something. They tend to get discouraged if something doesn't come out just right and these are very easy and basic and will help to give them a boost in their confidence.